Every runner has certain things that they need in order to run. Or perhaps I should say “need” because really, the only thing you truly need to run is a pair of working legs with the feet stuck into comfortable running shoes. So really, it’s more that all runners have certain things that they prefer to have to make their run more comfortable/efficient/enjoyable/etc. 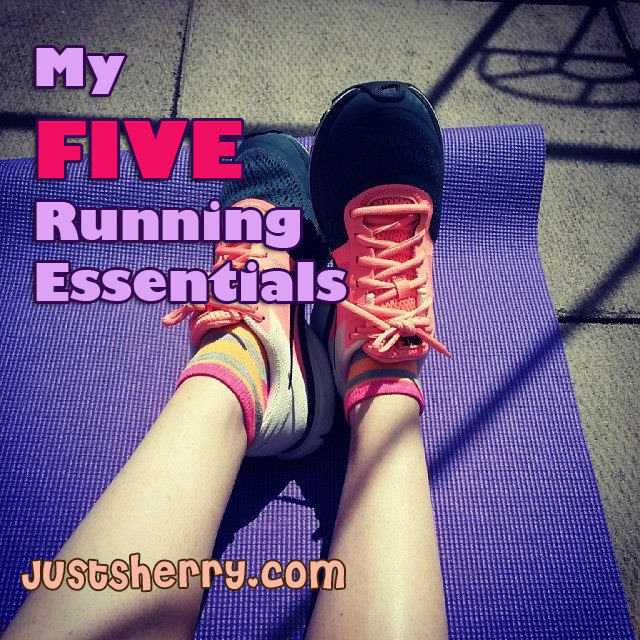 Here are the FIVE THINGS that *I* “need” when I head out my front door to take a run whether I’m doing it for training purposes, to de-stress, or just because it’s a beautiful day and I’m in a gazelle-like mood. Obviously you can run in whatever shoes float your boat but I’m pretty in love with my Nike Women’s Air Pegasus+ 29 Running Shoe . I adore them because they have just the right amount of cushioning for me. I like to be able to feel the ground beneath me to an extent but I like some padding too. However, I’ve tried on some shoes that had SO MUCH padding that I felt like the running version of The Princess and the Pea. I like a nice in-between. Whatever shoes you get, make sure that you’ve been checked by an expert. I went to Running Room and they had me walk and run in my socks; the expert serving me said I have a neutral foot and arch, no under- or over-pronating so he suggested a few different pairs and I went with the ones that felt best to my feet. If you do tend to pronate one way or the other, you’ll want shoes that compensate for that. There are quite a few different apps out there that will track your movements as you run and I’ve tried several. I actually started with the Nike+ app but I found it’s not very accurate even outside with the GPS. I tried out Runkeeper and it is much better for me. The most it’s ever been off is 1/2 a km so that’s pretty good. The only downside is it doesn’t have an accelerometer for treadmill runs but I try to avoid doing too many of those anyway. I really like the fact that I can access the camera easily and I think my absolute favourite thing is that when I have it set to alert me to how far I’ve run and how fast at specific intervals, it pauses my music first so that I don’t miss my favourite songs! You can download it for free at the Google Play store or on iTunes. Last year I went on my last long training run before my 10K race and spent a great deal of it wishing that I had a couple of bucks on me so I could hit up a gas station and buy a bottle of water. It was sunny and quite warm, and despite hydrating really well I was super thirsty. This year I bought a belt to carry water. 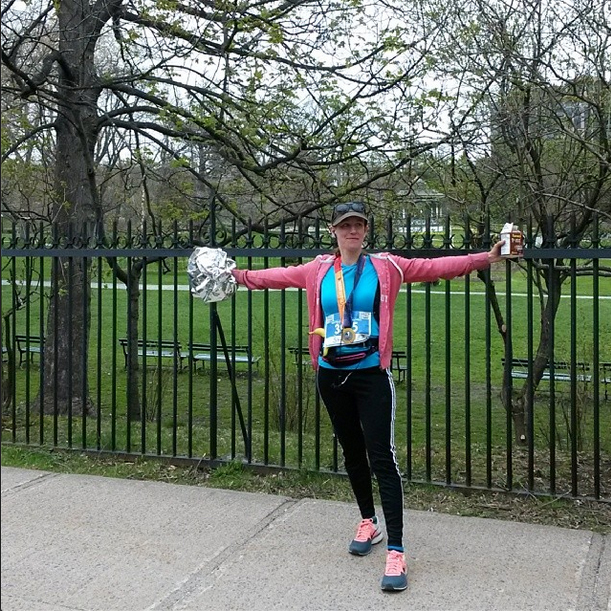 It was a really good investment because it helped on my longer training runs and it was useful for a couple of long stretches of the race where there weren’t any water stations (especially on The Endless Hill inside of Point Pleasant Park!). I bought mine at Running Room for about $20 on sale but it’s similar to this one . Basically it goes around the hips and you can wear it with the bottle in front, to the side, or at the back. I prefer it at the back, just slightly off-center so the nozzle doesn’t keep digging into my spine (note: always make sure you CLOSE the nozzle; I spent one run wondering why I was sweating so much only to realize it was open and my water was spewing all over the place, oops!). Oh music. I love my music. I know some people prefer to run without any extra sounds and just enjoy the sounds around them. I am not one of those people. I’ve had my iPod die in the middle of a run and it wasn’t the end of the world but I’d rather not listen to my own breathing when I’m hitting the pavement. What I listen to is a ridiculously eclectic mix. In general I listen to a wide variety of music and that is definitely reflected in my running playlist. I have a mixture of country, hip hop, rap, and bubblegum pop, with just a sprinkling of cheese. On race day I started out with “Beautiful Day” by U2 (with the intentions of keeping me from bolting out too quickly which didn’t quite work out the way I had planned, haha), later I was bopping along to “Happy” by Pharrell (my current favourite running song), and eventually I hit my #1 motivational running song, “Eye of the Tiger”. My playlist rotates through Jay-Z, Britney Spears, Adam Lambert, and Eminem all in one fell swoop. It works for me. Oh my Spibelt. How do I love my Spibelt? It is the most amazing thing I’ve acquired for running so far. Yes, the shoes are very important, the app and the playlist are useful, and the hydration belt matters greatly when the run is long or the weather is hot. Yes. HOWEVER. I have a rather ginormous phone. I got myself the Samsung Mega when I renewed my phone contract and I love it because it IS so big. It’s perfect for taking and looking at pictures and it’s wonderful for browsing facebook or the Internet. Unfortunately when I chose it I hadn’t started training yet and I wasn’t thinking about running because I was distracted by the shiny, beautiful screen. The first time I ran I realized I had no way to conveniently carry it. It’s too large for any arm bands that I found and really, it’s wider than my arm and would have looked ridiculous. It made my hand cramp up if I held it too long. My hydration belt had only very tiny pockets convenient for holding some change, a keychain, just small things. Running without a phone never felt like an option to me because I like being able to reach George if something terrible happened (like say, falling or twisting my ankle far from home). As a result, I put up with the hand cramps and carried it. I felt like I was one step away from running with my laptop, that’s how big it is. 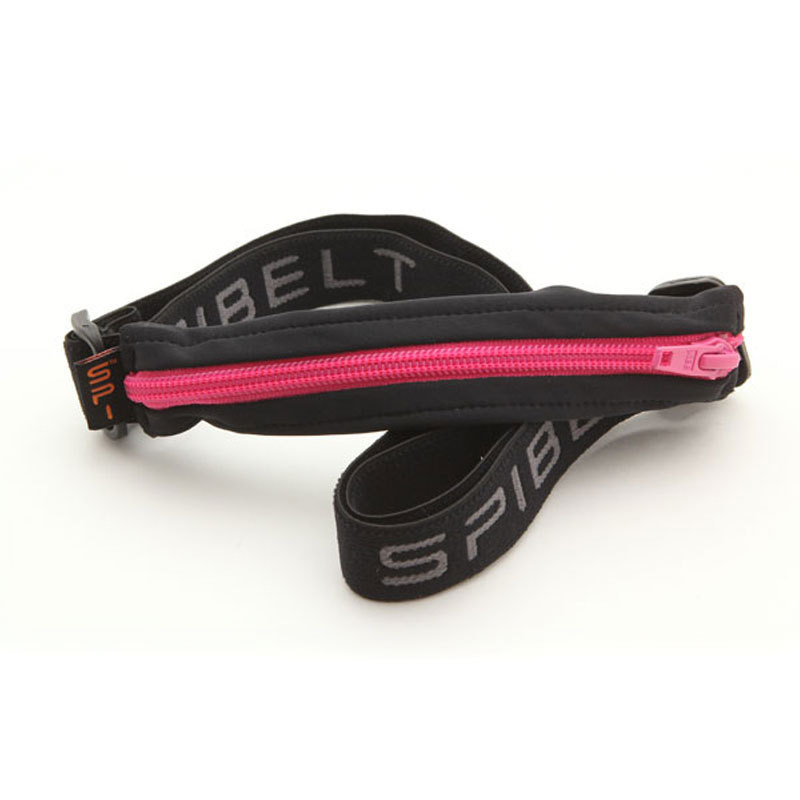 Then I was reading some of Kelly’s favourite things for running over at Run, Selfie, Repeat and she mentioned the Spibelt that she uses to carry her phone. I clicked the link on impulse and much to my shock they had one that was big enough for even my phone! It claimed to not bounce and was really cute to boot. I decided it was worth trying. In all honesty, when my package first arrived and I pulled my Spibelt out I thought they had sent me the wrong one because it was so small. It was mere days before the race and I thought, well so much for that. But I looked closer and lo and behold, it stretches! A lot! It was indeed the right belt! I put it on, slipped my phone inside and marveled at how perfectly it fit and that it didn’t look ridiculous like it would in an armband. I took it for a test run on my treadmill for a few minutes, and just like it said on the site, there was no bouncing around and it didn’t even loosen up with movement (my hydration belt does tend to need tightening every so often on a long run). I was ecstatic! It meant that I was free to run without anything in my hands for the first time this whole running season. With the zipper left open just a crack so that I could plug my earphones in I was able to still have my Runkeeper app monitor my distance really well, and it was easy to slip the phone out to take a few photos along the way. I used the pockets on my hydration belt to hold my fuel, but you could easily slip a phone, some fuel, a health card, whatever into the Spibelt. I am so incredibly happy with this belt and I will never run without it ever again! 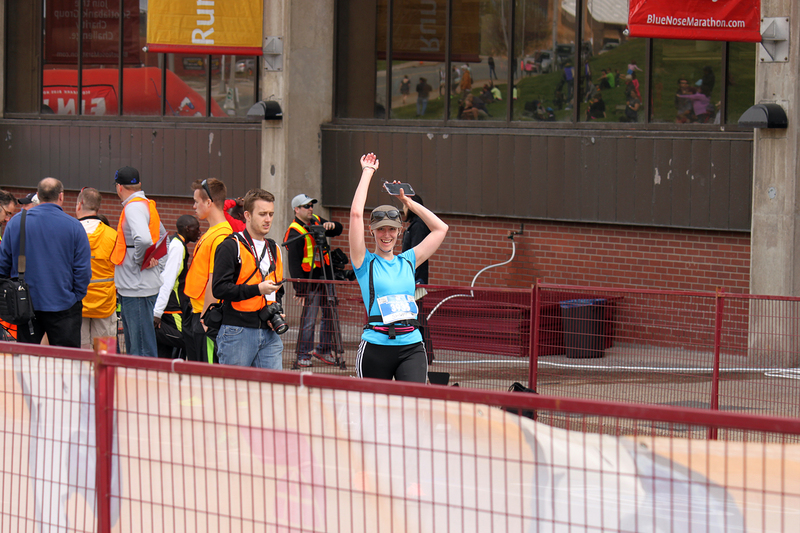 You can see my Spibelt just below my race number, it doesn’t get in the way at ALL. So! Those are my personal items in my survival kit. Obviously not everyone will want to run with the same things and I don’t always need every single thing. If I’m heading out for a 5K run around my neighbourhood and it’s cool out I don’t need my water. Overall though, these things all work together to make my running an even more enjoyable experience than it already is. Now the fun stuff – Giveaway Time! I was provided with a second Spibelt to give away to one of my readers! It’s exactly the same model as mine so if you have a large phone like I do, you’re all set. If your phone is a more reasonable size you’ll be able to carry your phone, some ID, some fuel, whatever you need for your runs or your hikes. It would even be great tucked under a shirt at a summertime music festival when you don’t want to carry a purse; just toss your ID, bank card, cash, keys, etc in it and you’re set! The one mandatory way to enter is to leave a comment below answering the question: What’s in YOUR running survival kit? If you’re not a runner you may substitute for telling me what activities you do where a Spibelt would come in handy! 1. Sign up for my newsletter! Then let me know if your comment that you’ve done so or you were already subscribed. 2. Like my page on Facebook and let me know that you did so. Find my “after the race” photo on Instagram, as seen below and leave me a comment. 4. Find the following image on my Instagram feed and leave a comment! Contest closes at 11:59 pm Atlantic time on June 7th. *This contest is only open to residents of North America due to shipping costs, sorry! Good luck! I love love love my road ID (http://www.roadid.com/Common/default.aspx) I have the slim, which is perfect for everything. Plus I know that if I do get knocked off my bike, or have to get pulled out of the pool or hit by a car (so many dangers!) that everyone will know (1) who I am, (2) that I have a medication allergy and (3) I’m an organ donor (hopefully I won’t need that one), Plus who they can call. I feel silly writing this – but my running essential is my Enell running bra. I had the hardest time finding ANYTHING that would a.) fit me, and b.) give me SERIOUS support. These bras are not cheap, nor are they anything to look at, but they wear like iron and I swear it is so sturdy and supportive it took 3 minutes off my 5K time! My running survival kit is just my iPod. I can do a run with very little but I need my music to motivate me. My big one is my cell phone. it has my music on it, i can take picturez, and i can call in an emurgency. Definitely my Sports Bra! Ha ha ha! How to pick just one! LOL! I guess #1 is my water bottle, I have a palm holder for it and I get really thirsty running in teh hot Florida weather. But my ipod is definitely a close second! Ooh! I hope I win! I could use some thing liek that! My essential item is my Runkeeper app! Oh man, the Spibelt sounds amazing! I think my #1 running essential–and this is weird–is chapstick! I feel like the longer I run lately, the more I mess with my lips! I think that if I keep them hydrated it helps me not to fixate and constantly lick them haha!